FARMINGTON — It takes a lot of food to prepare 24,000 meals per week. Not only does Sodexo, the food service at the University of Maine at Farmington, do just that, but it has already surpassed a UM System goal of buying 20 percent of the food from local sources by 2020. During its first year — beginning July 2016 — at UMF, Sodexo bought 21.3 percent of its food from local sources and has already bought 24.8 percent locally from July through September of this year, said Adam Vigue, Sodexo general manager. A commitment to incorporating local food into their daily menus was part of the company’s negotiation with the University of Maine System, with a goal of 20 percent by 2020, but it has been adopted by the company worldwide. It is not about buying 15 pounds of tomatoes from a local farmer in Franklin County but from a compilation of local farmers who can produce the nearly 400 pounds of tomatoes needed each week, said Doug Winslow, executive chef at UMF’s Sodexo. Maybe one farmer has 350 pigs and another has 450 to make up the quantity needed, he said. The food must be purchased in Maine, within 150 miles of the campus, to be considered local, Vigue said. Produce, dairy, meat and poultry are the highest percentages in total foods purchased locally. Most of the meat and fish used is purchased through Central Maine Meats in Gardiner. At UMF, Winslow’s grocery bill tallies $240,000 since August. “About $1 of every $4 dollars spent on food buys local food and we are working on it,” Vigue said. The UMF food service is looking into freezing an abundance of crops grown in “The County,” as the most northern Maine county of Aroostook is called, including broccoli, corn and green beans, for use in February, Winslow said. Producers from around the state have been invited to events hosted by Sodexo, where they can ask questions and see how they can increase production. They can grow larger quantities and know they will have a buyer, he said. 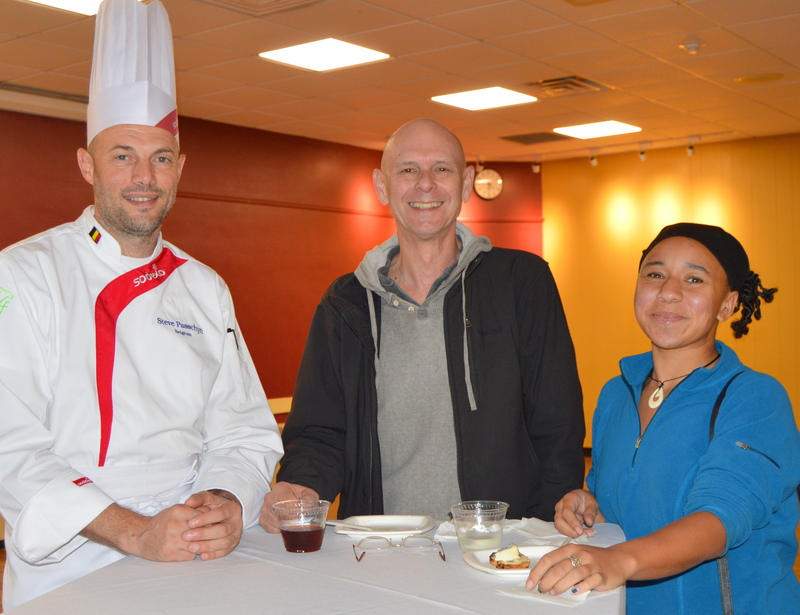 As the only Maine university visited by Sodexo’s global chef, Steve Passchyn of Belgium, this week, UMF welcomed the community to a meal Thursday and a reception Friday for a taste of Belgian food. More than half of the dishes he cooked for the events were made with local food, including rabbit, cheese, meat and vegetables, Vigue said. As part of the Global Chef Program, top Sodexo chefs are chosen for a monthlong international residency. Passchyn is spending five weeks mostly at colleges and universities in Massachusetts, New Hampshire, UMF in Maine and on to Canada where he shares authentic food from his country, teaches his ways of cooking and learns from others. 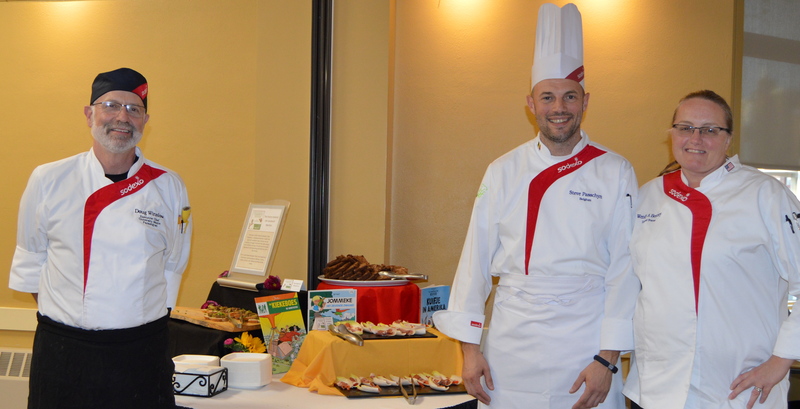 As a chef with Sodexo for nine years, he travels to many universities, high schools and hospitals to help make meals better with local foods. This is his first trip to the states. He found that local students liked his beef stew and beef braised in beer, endive with ham and were even willing to try rabbit. But, it was the chocolate desserts that they loved, he said. His chocolate pie met with rave reviews. Wendy Benney, Sodexo regional executive chef, was chosen as a Sodexo global chef a few years ago. She traveled to Thailand where she shared tastes of New England, including baked beans, macaroni and cheese, a Thanksgiving dinner and whoopie pies, all made from their local foods. She even created a fluffer-nutter, in the form of a cupcake, after finding marshmallow fluff in a Western market, she said. “It was great to be immersed in the culture and to understand the way they look at food,” she said. Sodexo meals are available to the public every day at UMF for a moderate price, Winslow said.